I couldn’t help myself. I was at the former “Wild Oats”, now “Whole Foods” store yesterday and there were the last of their flowering kale offerings on sale for 99 ¢ each. You know me by now… if you read this garden journal. I am a frugal gardener, but also an addicted one. I could not pass up that tempting combination of good price-good plant that I had been wanting. So I bought two and stayed out after dark last night planting them up tout suite. I had the perfect idea for them, and since I was out there gathering leaves in the wheelbarrow ( which several of the kids were asked to do, but somehow ??? didn’t get done! ), I dug out the dead annuals from the urn planters, put in the kales, one in each pot, and grabbed the pruners to prune off some red pine flourishes. Voila- a couple Christmas porch planters for the recently turned cold weather. A bit “shabby chic” and elegantly decayed with the remnants of the variegated ivy. I had meant to buy some kale plants earlier, they are the annuals of the winter garden (and in some years winter through). When everything else has frozen to a sodden grayish mass, there are the frilled circlets of subtle color bedecking their garden spots, flowering kale. I think they might even last in the containers if I cover them in the worst of the freezing weather. Somehow in the self flagellation of denial “No, I cannot rationalize buying more plants when I haven’t planted those sitting on the deck awaiting their turn”, I say to myself I did not buy the ones that were offered for sale earlier. I was prepared to do without, but thank goodness for discount sales! Now I have two very pretty pots at the front entrance. Much prettier than artificial decorations and doodads. 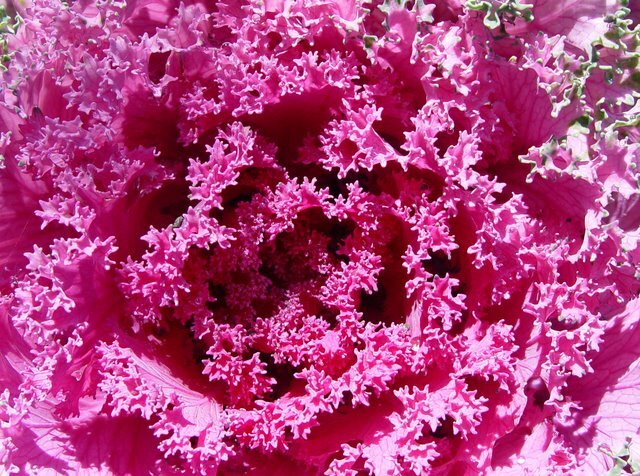 I do think the magenta centered kale could do with some pink accents, or something like that, so some artificial doodads might be tucked in anyway. I think flowering kale is one of those plants that would be very worthwhile growing from seed for oneself. They are started from seed in late spring, like well drained, regular soil in the garden, and potting medium if grown in a container. Like all cabbage plants they do like a little enrichment to the soil, so some added manure (rotted down) or veggie fertilizer works well. According to a fact sheet it is the the central leaves of the plant that color because the leaves lose chlorophyll after several days of night temperatures below 50º F. Then the colors are revealed, which ranges from white through pink and red. It takes 2 to 4 weeks to develop the intense colors after the start of cool night temperatures. Sow seeds in a corner of the vegetable garden, planting 1/2-inch deep and 3 inches apart.